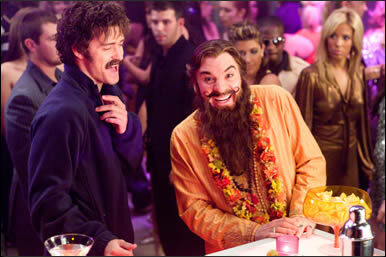 LOS ANGELES -- Comedian Mike Myers and superstar Justin Timberlake were two of the many stars that helped light up the world famous Grauman's Chinese Theatre in Hollywood and delighted hundreds of screaming fans at the premiere of the new comedy The Love Guru. Oh yeah, they even let in a few hockey players too, since Myers would not have it any other way. "I love the game of hockey, it has given me so much," said Myers, who co-wrote the film and stars as the Guru Pitka. "I just can't believe I made this movie and there is hockey." Not only were there hockey players, but there was the Stanley Cup at his latest movie's premiere. "My fantasy, of course, is that the actual Stanley Cup is won by the Maple Leafs and I will get the chance to hold it," Myers said. "It is not time yet. I shall not touch that celebrated trophy until it is the Maple Leafs. "I don't even look at it. I ignore it." The Red Wings' Chris Osgood, however, was hard to ignore, as he paraded into the premiere with the Stanley Cup in tow and walked the "blue" carpet. "I was expecting it to be red," Osgood said. "But since this is Mike Myers and he loves the Leafs that must be why it is blue." That's right. The proverbial red carpet was Toronto Maple Leaf blue on this sparkling night in Hollywood. But the blue carpet didn't make it any less nerve racking for someone walking the red carpet the first time, especially if they are also carrying a 35-pound, 116-year-old trophy. Advice from 2-foot-8 actor Verne Troyer, best known for his role as Mini-Me in Myers' Austin Powers series, and plays Maple Leafs Coach Cherkov in The Love Guru. Troyer -- a Michigan native and Red Wings fan, claimed he did not have a line in the movie where he did not yell after being urged by Myers to study former Maple Leafs coach Punch Imlach's behavior and mannerisms -- was able to lend a few words of advice to Osgood. "He relaxed me a little bit," Osgood said. "These last couple of days has been great and it is a thrill to be here to represent the League and show off the Cup. There are a lot of people out here who did not even know what the Cup is. They are all (now) more excited about hockey than I could imagine." Two guys who do know a thing about the Cup are the Anaheim Ducks' Sean O'Donnell and George Parros, both of whom also appeared at the premiere, in support of Rob Blake, who has a cameo in the movie. "We are friends with Rob," O'Donnell said of himself and Parros. "But we are going to watch this and give him a rating. We are not here as fans, but more as critics." To which Blake responded, "I do not want to hear their take on it." Blake was more curious about seeing how much of the movie he was actually in. Parros, on the other hand, was more curious about the mustache that Timberlake sports in the movie than perhaps even the movie itself. "His (mustache) looks pretty good, I am excited to see that on the big screen," said Parros, who sports a pretty impressive mustache of his own. "And he has a nice fro to go with it too." George Parros, who has a pretty good mustache himself, admired the hairy lip of Justin Timberlake's character Jacques Grande in the movie. 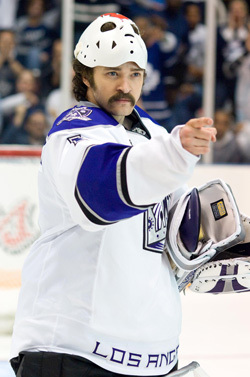 While Parros admires Timberlake's "stache and fro," Timberlake, who plays L.A. Kings netminder Jacques Grande in the movie, admires what Blake, O'Donnell, Osgood and Parros do for a living. "I have the utmost respect for those guys before the film and more so after the film," Timberlake said. "They are so freakishly coordinated. To skate as fast as they do and do what they do, they are some of the most talented athletes I have ever seen." Co-star Romany Malco, who plays Toronto Maple Leafs star Darren Roanoke, agrees. "I learned how to skate for the movie and now I skate three times a week and I am trying to get it up to four." Though, he added that he has a healthy fear of Blake. "Rob Blake tried to kill me," Malco said. "Rob Blake has skills. Here is the problem with his acting. He was hired to be really mean to me and I don't know when he was on or when he was off. I always spoke to him about stick's length away." Though Malco may fear Blake as a result of the movie, Myers has formed a very high opinion of Timberlake as shooting was completed. "Justin Timberlake might be the most talented person I have ever worked with," Myers said. "There are three people that I feel like I am related too, Dana Carvey, Ellen (DeGeneres) and Justin Timberlake, because every time I see them we just dance." Timberlake received probably the loudest scream of the evening when he arrived from the huge crowd of onlookers on Hollywood Boulevard, which prompted one reporter to ask who the real Love Guru was. "Yeah, I am going to give Justin Timberlake love advice because he needs help because the gals don't like him that much," Myers said tongue-in-cheek. "He is the real Love Guru, I am a pretender." The star-studded premier also boasted Mariska Hargitay of Law and Order: SVU, as well as the gorgeous Meagan Good, who plays Prudence and is probably best known for her appearance in You Got Served, Manu Narayan, who plays Rajneesh, and Telma Hopkins, who plays Lillian Roanoke and is probably best known for playing Rachel Crawford on the popular 90's sitcom Family Matters. Unfortunately, one of the stars, Jessica Alba, was unable to attend as four days ago, Alba, who plays Toronto Maple Leafs owner Jane Bullard, gave birth to a baby girl, Honor Marie Warren. The film opens June 20 in the United States.